Dean Cappello, the chief content officer for WNYC gave the Times a wonderful eulogy for the enormously popular Car Talk whose hosts, Tom and Ray Magliozzi, are retiring after 35 years. 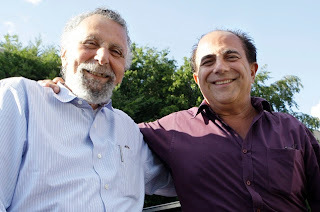 The show will stay on the air in reruns for an indeterminate period of time ("Host of 'Car Talk' to Retire After 35 Years of Automotive Banter," NYT, 6/8/12). Eric Nuzum, vice president of programming for NPR remarked to the Times that there are enough of the highest rated call-ins (the Magliozzi’s rate calls from 1 to 5) “to make up eight years of material.” But here is what Cappello said, “ ‘Car Talk’ is about the human condition. It’s about the desperation you feel when you’re standing in front of something that doesn’t work, and how you work your way out of it.” Car Talk is also a little like the movie Good Will Hunting, to the extent that it’s spiritual and technological message is rendered in a thick Southie idiom. The fact that the Magliozzis possess these accents along with M.I.T. degrees further reinforces the Good Will Hunting analogy. Remember Matt Damon was a math genius with a big time South Side affect. Remember also that A Prairie Home Companion was made into a movie with Meryl Streep and consider the fact that Matt Damon and Ben Affleck should reprise their Boston brogues and portray the Magliozzi brothers in the film version of the radio series. Naturally other clones have been spawned by the series. Long Island Public Radio has Dog Talk, with advice emanating from Tracie Hotchner who commiserates about man's best friend and one can be sure that the demise of the Car Talk will inspire others to deal with “human condition” in so far as it manifests itself when people are faced with objects “that don’t work.” Computer Talk would might be a candidate but in order to keep the verisimilitude, the sound studios of Bollywood would have to be enlisted—since almost all computer advice these days is outsourced to India.